We provide optimal conditions for rehabilitation due to the perfect combination of excellent facilities, therapeutic expertise and a specialist network of doctors. Our concept of high class therapies in combination with the exclusive holiday atmosphere of our hotel is unbeatable. It let’s you build up your strength and at the same time provides relaxation. Our therapy is designed to the patient’s needs and not the other way round. 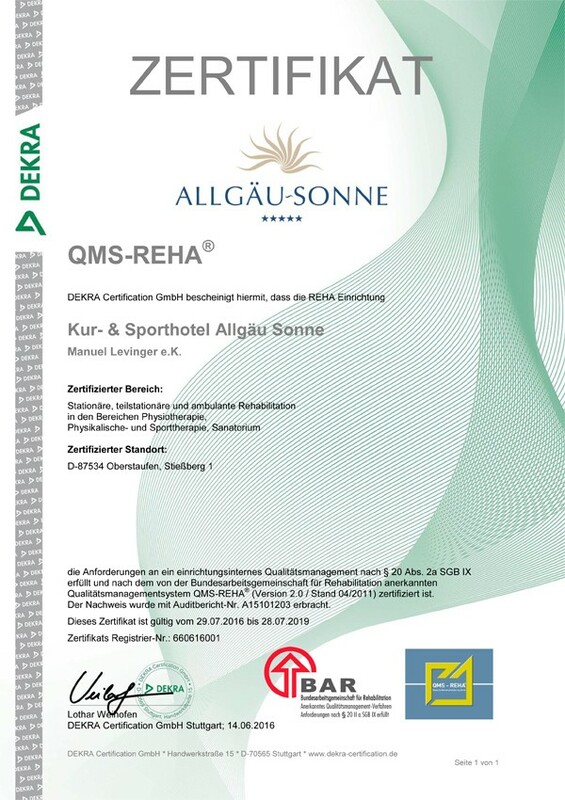 Our sanatorium and physiotherapy and massage department has been fully certified by the QMS-Reha® (§20Abs.2a SGB IX) since July 2013. With Sonja Hölzler (physiotherapist, manual therapist and registered sport and gymnastics instructor) and Dr. Hans-Harald Köhler (general practitioner on location) and also our cooperating partner, Dr. Thomas Wißmeyer, are here to advise and support you. Due to individual consultations and precise team work you will receive an individual therapy and health plan during your stay. A physiotherapist as personal contact partner, daily therapy sessions (Mo-Fri), exclusive individual administration and training sessions, personal briefing and care in our Therapy Centre and a constant up-date of your therapy plan, depending on your physical and mental state on the day, are standard service here in the Allgäu Sonne. Contact Mrs. Hölzler: +49 8386 702 965 or via physio@allgaeu-sonne.de. You have a private health insurance and you need a medical prescription for treatments. This can be issued by a surgeon, your attending physician or by our own in-house practitioner, Dr. Köhler. Recommended is a minimum stay of 10 days and at the earliest, 5 days after the operation. We offer post-operative aftercare on toes, ankles, knees, hips and shoulders (limited), elbows and hands. Travelling to and from the hotel has to be organised independently and you should be mobile, with or without supporting apparatus. The costs for accommodation and board have to be carried solely by the participant and are usually not supported by the private insurances. The costs for medically prescribed treatments such as physiotherapy, manual lymphatic drainage, medical massages, physiotherapy pool, training on our fitness-equipment and motion training, can be reimbursed by your private insurance company.